Okay, so I lied. This stir fry actually only took me seven minutes but I also prefer my tofu to be a little bit on the softer/less crispy side. I also had some of the veggies prepped already in my fridge. But, all things considered, I promise you will spend no more than ten minutes cooking up this delicious plate of food. 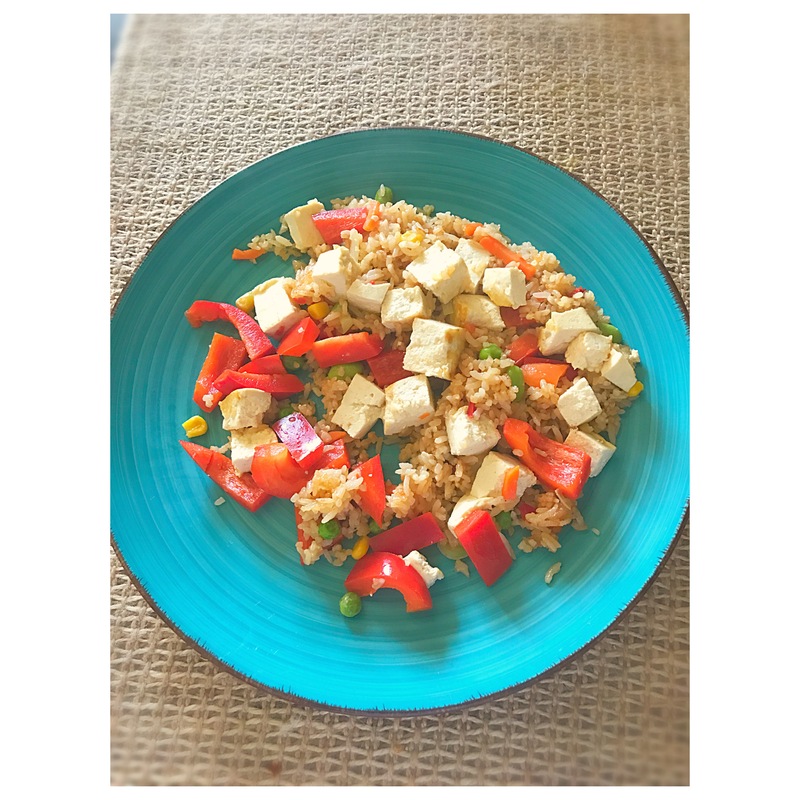 It’s loaded with protein (tofu and edamame), fiber (carrots, bell pepper), and carbohydrates (bc rice, duh). This stir fry isn’t entirely homemade, as I bought the rice already prepared in the Trader Joe’s frozen section, but I also added in some extra veggies to get even more bang for my stir fried buck. You can easily cook rice ahead of time for this, but I like the convenience of being able to whip it up quickly if I’m crunched for time. -3 oz. Firm Tofu (1sp) (Any type of protein will taste good, tofu is very low in points so that’s why I chose it). -Heat a non-stick pan with oil over medium heat (I use spray coconut oil because it’s easy and 0sp), cook bell pepper and carrots for about 3-4 mins. Add in garlic, ginger, and soy sauce. -Add in Tofu and cook to desired consistency. (I like to marinate tofu ahead of time, but it still tastes good if you don’t go out of your way to do this beforehand). -Add in rice and cook, stirring often, for 5 min. This meal is one of the many ways I have discovered that eating healthy does not have to mean giving up a ton of time. In fact, it took me less time to cook this up at home than it would to eat out at even the fastest of food places. I hope you enjoy! What are some of your favorite healthy and quick meals? Let me know in the comments below.